Today vehicle dismantling is an important part of the industry, which is increasingly growing. People can recycle their old vehicle even if it is at the last stage of its useful life. Nearly 80% of an automobile whether wrecked or junk can be recycled and reused in second hand auto market. This saves a lot of money to people who are looking to replace expensive or some major components of their automobiles. So, if you own a vehicle that doesn’t run due to any reason, it doesn’t mean that you can consider it as useless trash. There are a great many ways through which you can deal with your scrap vehicle safely and earn money out of it. The most lucrative option is to strip it off efficiently so you can sell those parts at reasonable prices. If you don’t have the valuable expertise to do it yourself, you can seek help from professional auto breakers. Taking a car apart is fortunately not much difficult to take a car apart. Although it can take time and heavy labour, but the whole process is very straightforward. Here are some easy steps to dismantle your old car. The first and foremost step is to remove all the wires and ducts. While doing this there should be no power, as you will also need to disconnect the battery. After this use a sharp knife to disconnect each and every wire and pipe from the engine. Next, drain out all the fluids in the automobiles. This includes draining the hydraulic fluids, diesel fuel, transmission fluids and coolant. If you wish you can store these fluids in well-sealed containers for later use. Use an engine life and connect it to the engine jack. It will help you easily take the engine off the vehicle. Make sure that you unbolt the mounts completely so you can easily lift up the engine. Either way you can also break it into pieces and sell it bit by bit. But if the engine is running well, make sure to keep it separately. If your important auto parts like alternator, radiator, and starter are not working properly, don’t panic. You can get best used car parts inventory online. This option will help you fetch highest money from this option. These days there are numerous dealerships that buy used and even damaged tyres. You can remove it at any time as you require. They will reuse it for a variety of purposes. After taking out the tyres make sure to lift the automobile off the ground. Make sure to have the essential equipment like drums, brake pads, etc. After you have pulled out all pulling major usable components. They will not able to put them apart all major useful automobile make sure to crush it into pieces. However, this process requires the right use of hammers, screwdrivers, and crowbars. Just take out the parts like fenders, doors, and roofs. You can sell these parts to the junk yard if they are in good condition. Meet Wreck Monster – Sydney’s leading Auto Dismantling & Disposal Company. When a vehicle turns into a junk or get old, it becomes a huge problem. As it is highly troublesome to get rid of a scrap vehicle and store it. Moreover, old and used vehicles often don’t bring in the price that the owner wants to get. Sometimes they can be highly difficult to sell, if there are major or minor damages. So, where to sell an old or junk car for cash that no more attracts most of the auto buyers? There is no need worry and just follow the new fashion of selling old and junk automobiles. Contact the Top Cash for Car service like “Wreck Monster” in your local area. This is an option that is less tedious and inexpensive to sell your unwanted car in Sydney. Car Wreckers are the experienced people who buy and remove used, junk, damaged, accidental and unregistered vehicles for cash. They are also legitimate professionals to wreck and recycle different kinds of undesirable vehicles in an eco-friendly way. Though different vehicle wrecking outfits pay different amounts of convenience and cash for vehicles. Therefore, make sure to select a reputed company that provides excellent cash for car services. If you choose “Wreck Monster”, you don’t need to worry about any typical auto selling related hassles. There is no need to pull out your vehicle for repairing and waxing it. Similarly, you don’t need to advertise it and negotiate with various buyers. As the “Wreck Monster” team will quickly buy it as is and pay you a generous sum of cash. If your old vehicle is not street worthy, then the common problem will be towing it to an auto recycling facility. For this you will need to spend a few hundred dollars for towing the automobile to the location of the auto recycling company. But the experienced “Wreck Monster” team will deal with all the problems related to a junk auto removal. 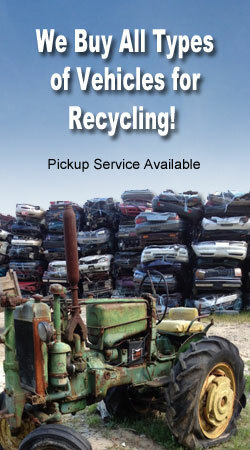 We are a licensed scrap auto buyers who offer instant cash and free junk auto removals at zero fees. This means you don’t need to pay any additional costs for getting your automobile picked up from your spot. Instead, you will fetch the best possible dollars during the process of selling your old vehicle to us. Generally, vehicles are not decomposable and it is very unfortunate for the environment. However, vehicles composed of a lot of materials that can be broken down, recycle and reuse for plenty of purposes. As there are skilled auto wreckers who are always looking to collect, dismantle and recycle an unwanted automobile. The Wreck Monster team is also properly certified to carry out environmental friendly auto recycling services. After taking apart automobiles, we appropriately dispose every damaged component for the sake of the environment. So, if you use Wreck Monster service for selling your old vehicle, there are various benefits that you can enjoy. Aside from guaranteed cash you can do your bit for the environment. When your car unexpectedly stops working properly, it is never a pleasant situation to be in. However, it is inevitable that your vehicle will eventually accumulate some damages that need to be repaired. The worst part is that every used automobile appears poorly worn-out once it start accumulating tiny dents and medium sized bumps. This obviously leads to a drop in its value but it doesn’t indicate that it’s the right time to sell it to your local car wreckers. When your vehicle, start working wrong, first make sure to contact your trusted mechanic. This way you can find out, if you can repair the vehicle using used or brand new parts. Most people choose to buy brand new parts for their vehicles as they feel that second hand parts don’t last longer. However, there are numerous advantages of choosing second hand parts over brand-new ones. The main benefit is that you don’t need to pay high rates because used components are available at half the price of new ones. There are also a great many stores where you can find used spare parts for every type of vehicle. But what matters is choosing an option that offer reasonable and high quality used spare parts with 100% guarantee. Contact our second hand car parts experts and purchase high on quality parts and components for your used vehicle. We offer parts at affordable rates so you can easily bring your vehicle’s performance back on track. Here, we have given best helpful tips that will help you maintain your vehicle’s performance and beauty using good quality parts. Upgrading your old stereo to an amazing new one will make your auto driving experience very enjoyable. This will even improve its overall value, if you plan to sell it in future. So, if you have an outdated stereo system installed in your vehicle, make sure to replace it with the latest one. One of the most important safety feature in an automobile is the headlights. These are so important components of an automobile that it’s must have them otherwise you will face severe consequences. Thus, it is an obvious common sense to avoid using dim headlights in your automobile at night. It will save you from getting severely injured in any bad accident. There are a lot of ways through which you restore your headlights. Moreover, you can easily do it yourself without requiring any high level of knowledge. However, if you just want to buy brand new headlights, it won’t cost you huge dollars. Car seat covers are the most common thing that is susceptible to getting worn-out easily. And you will know the cost of placing covers between your vehicle’s seats and people sitting on it, if it haven’t been protected for years. Even if you own a very old car, replacing its worn-out seat covers will enhance its appearance. There is a large variety of seat covers in terms of styles and colors that you can choose. If you have huge amounts of scrapes, dings and dents on your vehicle’s body, taking it to panel beaters will be the best solution. It will make a huge difference in its appearance that it will be the envy of the neighbourhood. Its cost of repairs will however depend on the amounts of dings and dents in your automobile. When any vehicle simply gets too old to be used or wrecked in an accident it becomes such a hassle for the owner. And old vehicles are really a big hassle, particularly when they are either broken or not-roadworthy. In such cases, it is not only difficult to make cash out of the vehicle but removin it also become a stressful task. You will have to arrange a towing facility that can take your wheels to the depot of the recycling company. This will be a very expensive affair depending on your vehicles form and size. Usually, it can take a lot of your time when it comes to driving your unwanted automobile to our yard. Aside this, it will for sure cost you some cash, particularly if your vehicle is broken down and in a non-running condition. But when you contact our team, we can take this hassle at no further charges. As we will definitely provide you free of charge removal services at no extra money. So, you don’t need to take make time from your busy schedule and do the stressful job of towing your automobile. The Wreck Monster team specialises in paying top dollars for junk vehicles. Being the experts we know how to assess true value of an automobile and avoid biasedness. We can pay you as much as $15,000 for your old car whether it’s engine not-working and the body is totally wrecked. We will put the best possible money in your pocket based on the overall value of steel and metals in your automobile. You only need to complete our cash quote form and get an instant cash offer. If you want, you can also get cash assessments over the phone with the special expertise of our appraisers. We provide quick auto removal which is a totally free from service. This is a great convenience, if someone can take away your broken vehicle on your behalf. We take care of paperwork and other related hassles as well. So, you will simply end up getting the top money in your wallet at your doorstep. Often automobiles that are damaged, broken or not roadworthy are difficult to load in the tow truck. This is where our skilled towers take care to load the automobile safely without damaging the surrounding things. Also, we do a safe and sound removal task which doesn’t harm the environment in any way. We have appointed experienced vehicle towing experts for this. Plus, we use latest techniques and resources to pick up wrecked or accidental automobiles from the NSW roads. How does Cash for Cars work in Sydney, NSW? If you want cash for a vehicle that is no longer working, it can be near to impossible for you. And, your old or scrap vehicle will be still wasting away a pretty much valuable space in your property. This is where auto removal companies support with hassle-free services in order to sell any unwanted automobile. Cash for Car or car removal companies established in Sydney are known to offer buy any type of vehicle and provide free removals. If you want to a meticulous and convenient option to sell a vehicle, then it’s best to contact Auto Wreckers like Wreck Monster today. We guarantee the easiest possible way to fetch cash out of undesirable wheels. This is valid regardless of their basic features like make, model, year and condition as well. They just know what to do with each and every type of junk automobile in order to get the best value out of it. As a result of good knowledge in this field, cash for car services are interested to buy any kind of unwanted automobile. Not just this, these companies will also offer you top cash that will be very handy. Whether your vehicle have collected dust after being stuck in your driveway or garage for years. Or, maybe it has been recently smashed in flood, hailstorm or a road accident. They will be glad to pay you fair money not essentially based on the working parts but its scrap metal value. Scrap Car removal is one of the most tedious and expensive activities during a sale process. But these days’ cash for car services have made it very simple and quick. They schedule free removals for a wide variety of automobiles and collect it from the location of the customer itself. Whether you have a regular vehicle, commercial truck, van, Ute, 4wd, SUV or motorcycle. They will remove it safely. Furthermore, they provide fuss-free auto wrecking services that are also safe for the green environment. While dismantling vehicles, they ensure to take apart each and every component for reconditioning and reusing it. All the attached paperwork is also arranged by the experts of the car wrecking team. You don’t have to pay any hidden costs or administration fees. If you want to do some help to the environment and safely dispose your unwanted wheels, Car Removal Company is a suitable option. After breaking automobiles, they will take out all of the parts that can be detrimental to the environment in any way. These are then disposed using eco-safe methods to avoid causing any risks to the environment. While the parts and components that work properly are preserved for further usage. Thus, you don’t need to worry about polluting the fragile environment. Especially when dealing with experienced car wreckers. Contact the Wreck Monster – The leading Cash for Cars Sydney team today and scrap your old auto for smart money.